The quest for the best TV picture possible has been a long one, stretching back to the early days of cathode ray tubes and muddy black and white pictures on small and, compared with even the worst of today's TV's, grainy screens. Then we had colour and, decades later, high definition, both of which were game changers. The next game changer was the evolution from big, fat and heavy CRT's to liquid crystal, or LCD – the flat screens that have freed up space in our viewing rooms while also offering us better quality and larger pictures. LCD evolved to LED, which are really LCD panels with different "back lighting." Now there are two new technologies vying for your after tax dollars, one of which is a logical next step in the high definition evolution – 4K – and one of which is an absolutely ground breaking leap in picture quality: OLED. OLED stands for organic light emitting diode and the only thing you need to know about that is that it's a quantum leap from today's LED TV's (which can be exquisite in their own right) and offers not only a picture quality that absolutely knocked off my socks but which is also so thin that if I had 52 of them I could have very nearly shuffled and dealt them like huge playing cards. Since OLED's don't require back lighting, they can be very light and thin, as well as offering "perfect" blacks, and fantastic off axis performance (within limits - the picture doesn't lose its lustre, it just gets hard to see when you're far to the side). OLED's have been around for a while, but only in the couple of years have they become anywhere close to mainstream for TV's, though "AMOLED" (active matrix OLED) screens have been available on cell phones for several years. As for TV's, I remember seeing a Sony OLED at least a decade ago, and it was a remarkable thing that was cool to look at but totally impractical for home theatre because it was about a 12 inch screen that cost a ridiculous amount. I sure care about OLED now! LG, the South Korean electronics maker who, along with country-mate Samsung, is currently giving all the "established electronics makers" a run for your money the same way Hyundai and Kia are doing in the automotive marketplace, is making a major push to OLED, and the company was kind enough to send me their spectacular OLED65B6P, a 65 inch unit I got to live with for about a month. LG then made me send it back, before I could see if they'd be willing to take my soul, or maybe my grandson, in exchange for leaving it here. Yep, it's that good. Oh, it isn't perfect – in fact I found a couple of things about it quite annoying – but all that pales in comparison with a picture quality that reminds me of the golden days of plasma screens, except that even plasmas' rich colour performance isn't up to the standard of today's OLED. I say that as someone who has owned a 50 inch LG plasma or the past 10 years or so and is still completely happy with its picture quality. Or was, until about a month ago. The first thing you notice when unpacking a TV such as this – or, I daresay, upon seeing it in the store – is how incredibly thin it is. The 65 incher I've been testing is no thicker than the panes of glass that make up the shelves in our knickknack cabinet. I kid you not; the crack above about shuffling and dealing isn't much of a stretch at all. The bezel around the picture – the TV's frame, as it were – is equally tiny, so what you're getting is basically all screen, and how can one complain about that? And if you think your current TV shows every bit of fine detail possible (I thought my excellent reference 4K LED did until I put this one next to it), you're in for an "eye opening" experience. Setup of the OLED is mostly straightforward, though I think the reviewer before me may have stuck the wrong remote control in the box because it had a 3D button and this TV doesn't do 3D. The lack of 3D didn't bother me a whit, but the remote itself left something to be desired when it came to navigating the LG's menu system. I believe there's supposed to be one of those "mouse like" Magic Remotes included that you wave at the screen as well, a type I really don't like either, but the other reviewer must have forgotten to put it in the box as well – along with the bolts that attach the TV to its stand. I'd mutter "journalists!" in frustration, but I've screwed up some product returns over the years too, so better not to throw stones. LG uses webOS 3.0 for its interface and it works fine for the most part. It's a cleaner interface than on some TV's I've tried, and it also allows for good connectivity to your other devices. A couple of weeks after I received the TV there was a software update and the process of installing and updating it went smoothly via Wi-Fi. The update moved the volume display from the bottom of the screen to the right side, which seemed kind of silly and weird – but the more I watched the TV the more I appreciated it being off to the side, away from most of the picture "action." Once I'd tried them to ensure they actually work I turned off all the nannies that are supposed to improve the picture quality – sharpness, noise reduction, frame doubling, resolution doubling, etc. etc. etc.,. This prevented artifacts such as unnecessary grain or that awful "soap opera effect" that makes foreground objects look great, with everything else looking like it's been added later digitally. I wanted the OLED to display source material directly, with no messing about. And, boy, did it ever! I also set it up for my room, dimming the picture substantially from the default settings using the DVE HD Basics disc. I turned it down quite a bit, such is the incredible brightness of the LG, but didn't have to do any tweaks to the colour, tint, etc., which were fine right out of the box. LG has included audio by harman/kardon and it's very good TV sound, with good dynamic range and even pretty good bass all things considered. Heck, I'm amazed they managed to stuff any type of speaker into this cabinet, such is its tiny footprint. So if TV sound is important to you, this LG should serve you well. TV sound isn't important to me, because I always hook my TV's, and review TV's, into an external audio system and use it when I'm watching stuff in which the audio is important (i.e. movies as opposed to "Jeopardy!"). To facilitate that, the LG comes with an optical output, and it worked fine. For source material, I used a huge variety of stuff, from 1080i sports on satellite TV (which looked great!) to 4K YouTube via the Roku. Discs provided the best tests, and I tried everything from 480i DVD to regular 1080p Blu-ray and UHD HDR discs - using Oppo Digital's great new UDP-203 4K Ultra HD Blu-ray Disc Player, which up converts content to 4K beautifully if the source isn't 4K to start with. Some things I noticed quickly included the fact that the OLED's blacks were so deep that it looked as if the screen were turned off on those parts of the screen (i.e. black bars from letterboxing, etc). It also showed that some content's "fades to black" weren't as black as the phrase might suggest, because the LG's were clearly better. And that was just the beginning. Want rich colour? LG's OLED is a treasure for the eyes. Ditto for its performance with fine detail (part of this is undoubtedly the TV's 4K capability as well), which is absolutely stunning. I kid you not - it was such an outstanding video experience that it was almost like watching movies for the first time even if I'd seen them many, many times. That feeling extended to such venerable titles as Lawrence of Arabia (4K remastered 1080p Blu-ray), and Ben-Hur. More modern conventional Blu-rays, such as Guardians of the Galaxy, the Lord of the Rings trilogy, Avatar and the new Star Wars Rogue One, looked so good up converted to 4K by the Oppo that it made me wonder just how much better a real 4K disc could look. So I tried some 4K HDR discs and found out. And not surprisingly, there's an even more magnificent experience waiting with true 4K HDR, in which the colour and detail are even more impressive. I tried the Star Trek reboot discs back to back with their Blu-ray counterparts and, though the differences can be subtle if you're only watching casually, they're definitely there. Indeed, this LG put out what's easily the best picture I've experienced in my home, and I've not only been reviewing TV's for close to 30 years, I've also owned my share of high end screens. 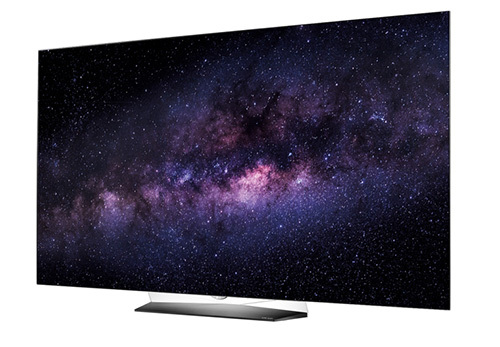 So, yes, 4K OLED is indeed a new world of video. Nothing's perfect of course, and I did experience a couple of weird issues in which one of the LG's HDMI inputs suddenly refused to work and it took a hard reboot (unplugging the system from the wall for a few seconds) to correct it. I put it down to handshaking issues, which raise their ugly heads periodically with HDMI, but I really don't know. The downside right now is that, like any new technology, OLED is expensive. The current model of this particular LG, for example, lists today on Amazon's Canadian website for $4699.99 CAD and is on Best Buy's Canadian site for $6999.99. However you slice it, that's a pile of after-tax disposable income in this age of thousand dollar 4K TV's, but if I had the cash to buy this TV today, I'd pay it happily. It's that good. My advice, if you're looking for a new TV and can afford it, is that you should run to your favourite retailer and pick up one of these fabulous units, especially if it's on sale. If you aren't looking for a new TV yet, then remember OLED when it's time for you to go shopping. It'll knock your socks off.